With your Wii connected to the Internet you can start sampling some of what WiiWare has to offer even without spending any Nintendo Points. The WiiWare section of the Wii Shop Channel currently offers the possibility to try demos of top titles in a variety of genres that you can play free of charge. Getting your hands on a WiiWare demo is as easy as downloading a WiiWare title. Simply visit the WiiWare section of the Wii Shop Channel and select “Search by Genre”. Next you choose the “Demo” genre to get a list of all demos currently available. Every demo can be downloaded to your Wii console or to an SD Card free of charge, so feel free to try as many as you like! Just pick the title of your choice, select “Download” and you will be playing before you know it! 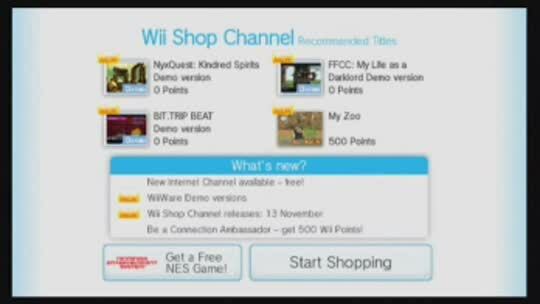 This video demonstrates how you can find demos in the Wii Shop Channel. You can try any demo that catches your eye! With your Wii connected to the Internet you can start sampling some of what WiiWare has to offer even without spending any Nintendo Points.